Our destination today was Yaxchilan on the Usumacinta River which forms the border between Mexico and Guatemala. 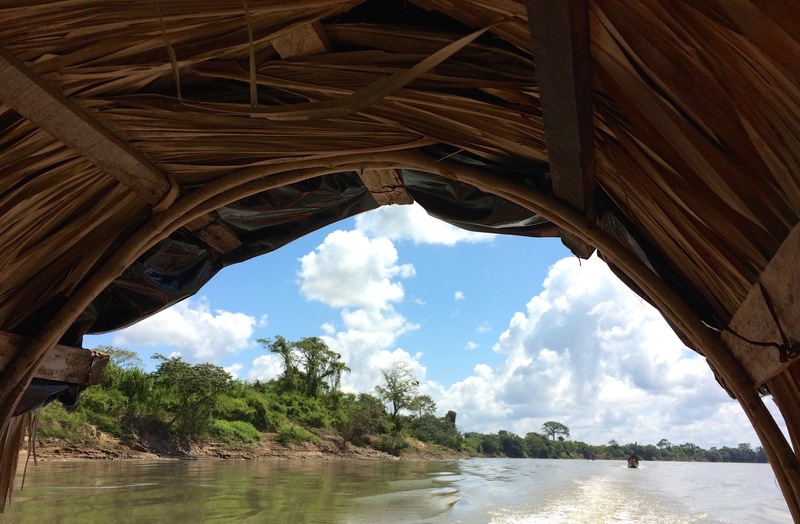 We boarded a tribal long boat with a thatched roof to keep off the sun and floated down the beautiful river. The boat rocked gently and, combined with the heat, we sank into a kind of torpor. All drowsiness vanished in a an instant the first time our boatman pointed to a shape like a large log lumbering down the bank into the water. Crocodile on the move! We’d watch the crocodiles moving slowly through the river, often disrespectfully close to the boat. All along our way we could spot tall, vaguely geometric shapes near the banks of the river. Peering closely, many of them seemed like green grassy versions of the square-based pyramids we’d been seeing at the archeological sites—only these had trees growing out of the sides. The guide would look out across the water, take in the shape all covered in green jungle growth, and nod his head. Yes, obviously another unexplored temple. He seemed a little blasé about it, but I wondered intently about the secrets it might hold. Will I ever know? Arriving at the ancient site of Yaxchilan, built on a large bend in the Usumacinta River that forms the border between Mexico and Guatemala, we spent a few vigorous hours clambering around its temples. This small ruin of the Classic period is known to archeologists for its beautifully decorated door lintels. Tourists like us were captivated by its Howler monkeys swinging just above us through the jungle canopy. Apparently you want to make sure you’re not standing directly underneath one or you could get sprayed. 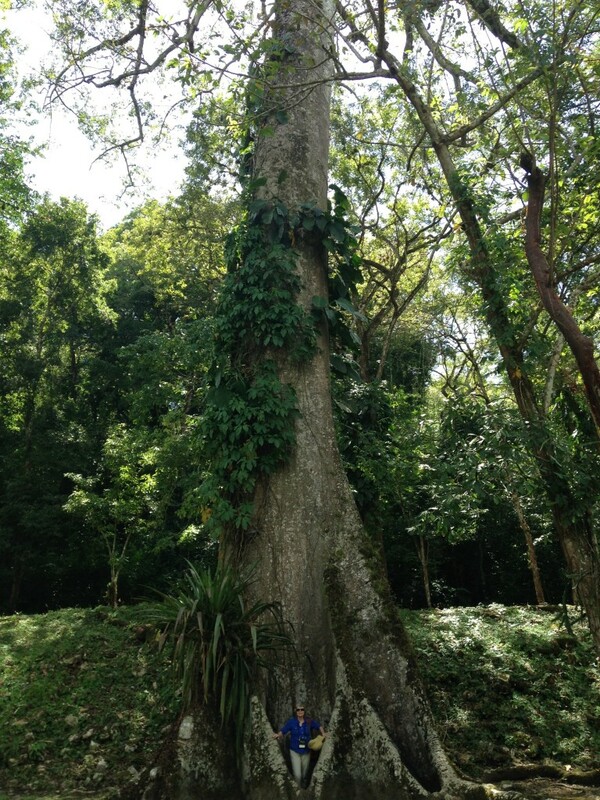 This Giant Ceiba tree is well named — truly one of the gigantic ancients at Yaxchilan. Returning to the river edge, we re-boarded the long boat, which transported us back up the Usumacinta River to the opposite shore from where we had started in the morning. Goodbye, Mexico. Hello, Guatemala. The lovely Usumacinta River with still the same crocodiles, I suppose, lumbering here and there behind the boat or down the river banks. Obviously these crocodiles didn’t know the difference between the Mexican and the Guatemalan side of the river. While we had seen wonderful archeological sites on this visit to Yaxchilan, Mexico, there are many other antiquities to investigate on a return trip. And who knows, maybe some day the as yet unexplored sites will yield up their lost stories.